In myths and tales, dwarfs and elves are small humanlike creatures, often endowed with magical powers. Dwarfs generally look like old men with long beards and are sometimes ugly or misshapen. Elves, known for their mischievous pranks, tend to be smaller in stature than dwarfs. Though usually associated with Scandinavian mythology, dwarfs and elves appear in the myths of many cultures, along with similar creatures such as fairies, gnomes, pixies, and leprechauns. Dwarfs are sometimes represented as helpful creatures or wise advisers as, for example, in the fairy tale Snow White and the Seven Dwarfs. More commonly, though, they are unpleasant, stubborn, and distrustful with an air of mystery about them. They may act in deceitful ways, or they may be openly hostile. In some stories, dwarfs steal food or carry off children and beautiful maidens. Elves take on a variety of forms. Different cultures have identified elves as nature spirits, minor gods, imaginary beings, dream creatures, and souls of the dead. Like dwarfs, elves have both positive and negative images. In the legend of Santa Claus, they work hard in Santa's toy shop. In other stories, they are mischievous beings who play pranks on humans and animals, such as leading travelers astray. Scandinavian Dwarfs and Elves. In Norse * mythology, dwarfs and elves are usually male and often live in forests, in mountains, or in out-of-the-way places. There are two kinds of elves: the Dökkalfar, or dark elves, and the Ljosalfar, or light elves. The Dökkalfar dwell in caves or dark woods. The Ljosalfar live in bright places or in the sky. Dwarfs and elves of the mountains are highly skilled metalworkers and artisans who have supernatural powers and make special gifts for the gods, such as a magic spear for Odin, the king of the gods; a ship for Freyja, the goddess of love and beauty; and a hammer for Thor, the god of thunder. But dwarfs and elves of the mines, who keep guard over underground stores of gold and precious stones, are unpredictable and spiteful. This association of dwarfs and elves with mining and precious metals exists in many legends and fairy tales. Other Mythologies. In Germanic mythology, elves are tiny creatures who can bring disease to people and to cattle or can cause nightmares by sitting on a sleeper's chest. They also steal newborn babies and replace them with deformed elf children. In Central American myths, dwarfs are associated with caves, forests, and fertility. In one story, a Red Dwarf uses his ax to cause sparks that a seer interprets in telling someone's fortune. The Bushpeople of South Africa tell of the Cagn-Cagn, dwarfs who killed the god Cagn with the help of ants and later restored him to life. Dwarfs and elves appear in the myths and legends of many different cultures. 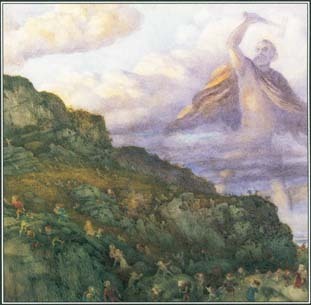 In this painting, Thor, the Norse god of thunder, chases a group of dwarfs across a mountain. dwarfs who act as helpful spirits in Crow mythology The Wanagemeswak are thin, river-dwelling dwarfs in the mythology of the Penobscot Indians. The Senecas have legends about the Djogeon, little people who live in caves, in deep ditches, or along streams. The Djogeon warn humans about dangers and sometimes bring good fortune. See also Leprechauns ; Norse Mythology ; Santa Claus . i LOVE this awesome accurate site! Thank you for saving my life because I am doing a serious project and this site helped me the most! Dwarves also exist in traditional West African culture. Interestingly, in West-African spiritual practice they can be summoned by a priest to appear in physical form. When they do appear physically, they interact with man kind by helping them with their day-to-day lives; for curing of sickness, protection, etc. Their contribution is essential because they are believed to be the masters of the land, and hence have immense knowledge on herbal medicine. Please contact me for more information on their physical manifestation. In some accounts, Elves are forest spirits and Dwarves are the Mountain cave dwellers. This has become a common distinction in popular usage, but has led to the Elves being so different in Western literature and portrayal, that the oriental creatures known as Hsien are scarcely recognizable as related creatures. Oriental has many varieties of spirit creatures, but the actual people known to westerners as Elves really have no counterpart in the folk myths of Asia.